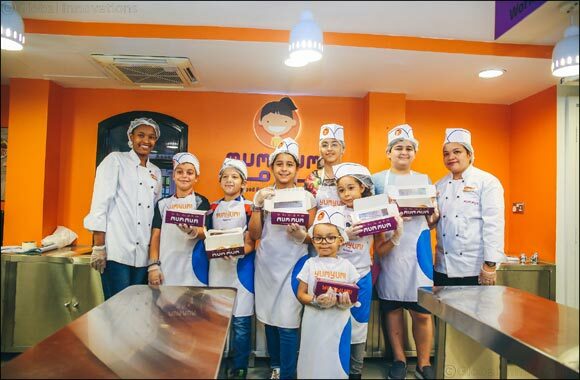 Dubai, UAE, October 23, 2018: Emaar Entertainment’s KidZania® Dubai has partnered with Mum Mum, the pioneering, locally-owned company providing healthy and nutritious meals to schools across the UAE, for the ‘Culinary School’ establishment in the children’s city. The KidZania® Culinary School instructs students on the art and science of food preparation that include the mastery and appreciation of the culinary arts and techniques. Chefs in the KidZania® Culinary School work as a team, enhancing their reading comprehension, math skills, hand-eye coordination and ability to follow directions while creating culinary masterpieces that they can take home and share. Lessons on nutrition and good hygiene are woven into each activity. Through the association with Mum Mum, KidZania® aims to teach kids about healthy and delicious food choices, giving them the tools they require to make positive and well-informed healthy lifestyle choices. Mum Mum is dedicated to improving the nutritional choices that children make. They supply meals to several thousand children every day in schools across the UAE. Their food is neither fried or frozen and they ensure that all food groups are proportionately balanced in the meals, and that the right amounts of salt and sugar are used. Mum Mum aims to demonstrate to schools and parents that it is perfectly possibly to offer healthy food options for the same price as unhealthy food options, and to challenge the myth that healthy eating is an expensive consumer choice. They provide high quality, nutritious school meals at the same price as less healthy options without compromising on flavour or portion size. Together with KidZania®, Mum Mum aspires to foster curiosity about food and a love of cooking that will hopefully stay with the young chefs throughout their lives.